If you’re a fan of three-note-per-string (3NPS) scales, and have gotten all the patterns down, you might want to add in chromatic passing tones to give your improvisations a more fusion or jazzy feel, even if you play mainly rock stuff. 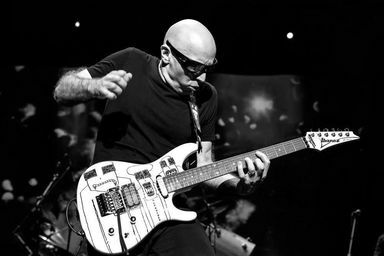 I got this idea from watching Joe Satriani’s hand movements when improvising, though I’m not sure whether he thinks about it this way. If you haven’t gotten the patterns down, check out our free eBook which shows you how to use just three patterns instead of the usual (and unnecessary) seven. What you’re going to do is shift your hand position to include the notes that fall either side of the pattern; some are in the scale but most are not. In the following diagram, the green notes are part of the scale, and the blue notes are chromatic/outside the scale. Simply shift your hand position to touch on or bring in the outside tones on the left side of the pattern, then return to the regular pattern. You can also do this on the right-hand side of the pattern, as follows. Again, the blue notes are chromatic and the green notes are already in the scale. This is a great way to start with chromatics because you can get out and back into the scale with one brief movement, rather than trying to play something chromatic by entirely altering your hand position and getting into trouble. Plus, it’s a far subtler way to include chromatic notes in your playing without sounding cliché and obvious. Try the same idea with any other 3NPS scale pattern, and remember to check out our free eBook to reduce the total number patterns you need to learn from seven to just three, still being able to cover the entire neck.